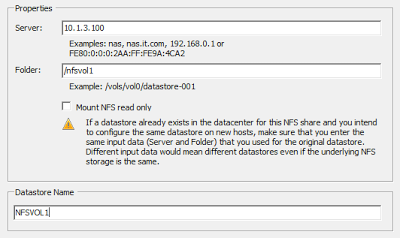 Carrying on from Part 2, the following post will run through setting up NFS on Clustered Data ONTAP and testing using a FreeBSD Linux system and also mounting as an NFS datastore to a VMware ESXi 5.1 host. And - if all’s well on the networking side - that’s it, we have our NFSVOL1 mounted in VMware! Note: This could also be done using the NetApp VSC (Virtual Storage Console) and will test this with CDOT at a later date. To get good at the CLI, the best way to learn is practice - create and recreate, again and again until you can do it in your sleep. The following commands will undo everything we’ve done in this post, and enable doing it all over again. The next two lines are only necessary to delete the ifgrp and aggregate created in preparation for the NFS bit. I’ll leave these in place for future posts in this series, so the following lines are just down here for completeness.